• Efficiently opens the scoured fiber mass without breakage to allow production of a more uniform carded sliver or batt. 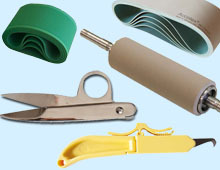 • Works with a large variety of staple fibers. • Helps remove vegetable matter, dirt and dust. • Blends different fiber types and/or colors. 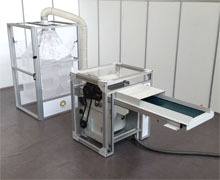 • Allows convenient storage and transport of opened fiber in ventilated big bags. • Separates and removes coarse, undesired guard hairs from the desired fine fibers. • Essential for dual-coated animal fleeces, such as cashmere, camel, llama, goat, yak, buffalo, musk ox and certain sheep breeds. • Opens the fiber mass after scouring. • Begins to align individual fibers into a parallel arrangement necessary to produce a smooth, consistent yarn. 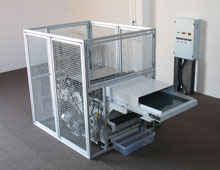 • Produces sliver or batts with a simple, easy-change trolly system. • Removes neps and very short fibers. • Suitable for a wide range of fiber types and staple lengths. • Self-cleaning rigid card clothing minimizes down time in sequential processing of different fiber types or colors. • Coils sliver into compact cylinders for easy transport to the drafting or spinning stage. • Measures the length of sliver as it is coiled. • Includes a yardage/meter counter, which permits the division of the sliver into identical units. • Attenuates sliver irregularities and draws fibers into a parallel alignment in order to produce a smooth, uniform yarn that maximizes the fiber’s natural luster. • Large pin field allows processing of long-staple fibers. • User-controlled draft ratios allow production of the desired sliver density depending on the final desired yarn weight. • Creel feed system improves handling of low-cohesion fibers with less sliver breakage. • Helps remove residual impurities. • Combines fast production speed with optimal results. 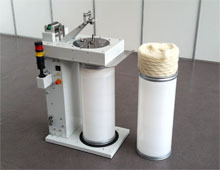 • Versatile ring-spinning system for yarn production from a wide variety of natural and synthetic fibers. • Allows production of the entire spectrum of yarn weights, from fine lace to bulky. • Quickly and easily switch between spinning and plying modes. • Computerized, touch-screen controls simplify yarn count calculations and allow the user to save frequently used settings. 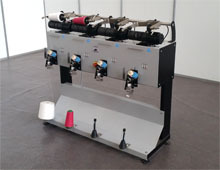 • Automated winding of yarn into user-defined skein lengths in either meters or yards. • Adjustable springs allow yarn skeining from bobbin tubes or cones of various sizes. 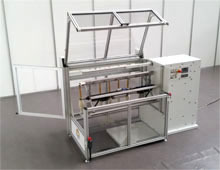 • Automated pneumatic tension mechanism allows for easy skein removal after winding. • User-adjustable thread guide permits a wider range of possible skein lengths, especially for bulky yarns. • Choose from two different designs, optimized for specific yarn types. • Custom built to suit small, medium, or large production. • Automated, with independent activation/deactivation of each head. • Yarn clearer to reduce major irregularities. • Spare parts for our machines or for equipment from other suppliers. • Accessories for the textile industry.